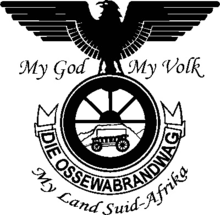 The Ossewabrandwag (OB) (Ox-wagon Sentinel) was an anti-British and pro-German organisation in South Africa during World War II, which opposed South African participation in the war. It was formed in Bloemfontein on 4 February 1939 by pro-German Afrikaners. During the 19th century, most of the Boers of the northeastern Cape frontier migrated to the interior, and established the Orange Free State and South African Republic, which were independent of Britain. In the Second Boer War (1899–1902), Britain conquered the Boer Republics. The Netherlands (and Germany) supported the Boer cause. After the war, there was a general reconciliation between Afrikaners and Britain, culminating in the formation of the Union of South Africa in 1910, under the leadership of former Boer fighters such as Louis Botha and Jan Smuts. South African troops, including thousands of Afrikaners, served in the British forces during World War I. Nonetheless, many Boers remembered the tactics used by Britain in the Boer War and remained resentful of British rule, even loose association with Britain as a Dominion. The chief vehicle of Afrikaner nationalism at this time was the "Purified National Party" of D. F. Malan, which broke away from the National Party when the latter merged with Smuts' South African Party in 1934. Another important element was the Afrikaner Broederbond, a quasi-secret society founded in 1918, and dedicated to the proposition that "the Afrikaner volk has been planted in this country by the Hand of God..."
1938 was the centennial anniversary of the Great Trek (the migration of Boers to the interior). The Ossewabrandwag was established in commemoration of the Trek. Most of the migrants travelled in ox-drawn wagons, hence the group's name. The group's leader was Johannes Van Rensburg, a lawyer who had served as Secretary of Justice under Smuts (as Minister), and was an admirer of Nazi Germany. More dangerous was the formation of the Stormjaers (Assault troops), a paramilitary wing of the OB. The nature of the Stormjaers was evidenced by the oath sworn by new recruits: "If I retreat, shoot me. If I die, avenge me. If I advance, follow me" (Afrikaans: As ek omdraai, skiet my. As ek val, wreek my. As ek storm, volg my). The Union government cracked down on the OB and the Stormjaers, placing thousands of them in internment camps for the duration of the war. Among the internees was future prime minister B. J. Vorster. ^ Marx, Christoph (2009). Oxwagon Sentinel: Radical Afrikaner Nationalism and the History of the 'Ossewabrandwag'. Münster: LIT. ISBN 978-3-8258-9797-0. ^ Van den Berghe, Pierre L. (1967). South Africa, a Study in Conflict. Berkeley: University of California Press. ISBN 978-0-520-01294-3. ^ a b Bunting, Brian Percy (1969). "Ch 6". The rise of the South African Reich. Penguin Books. ^ Williams, Basil (1946). "Ch 10 Smuts and the War in Africa". Botha Smuts And South Africa. London: Hodder and Stoughton. pp. 161–178. "No Land! No House! No Vote!" No Land! No House! No Vote!